Along this release, it will allow customers to create OData v4.0 endpoints and leverage the OData query syntax easily on multiple platforms, not only on Windows. 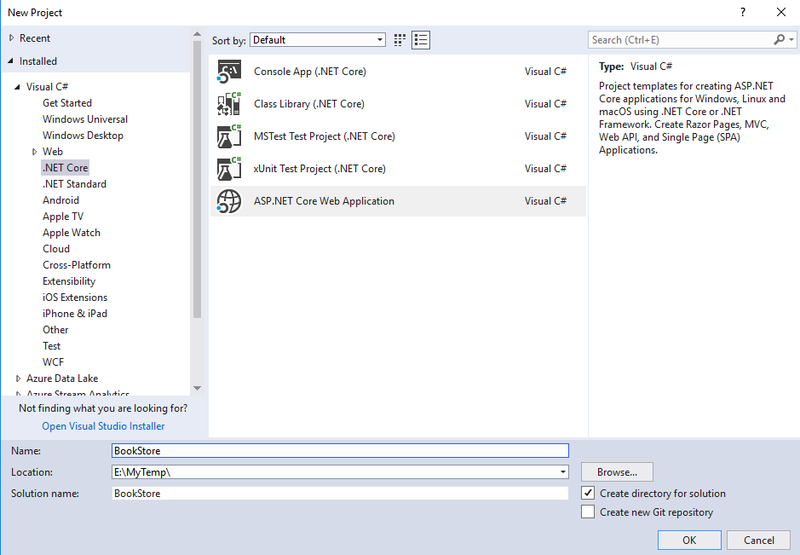 This blog is intended to give you a tutorial about how to build/consume OData service through ASP.NET Core OData package. Let’s getting started. For simplicity, we will start by creating a simple ASP.NET Core Web Application called BookStore. In Visual studio 2017, from the “File” menu, select “New > Project …”. Click “Ok” button, we will get an empty ASP.NET Core Web Application project. EF Core is also used in this tutorial, so do the same process to install “Microsoft.EntityFrameworkCore.InMemory” and its dependencies (for simplicity, we use In Memory data source). A model is an object representing the data in the application. In this tutorial, we use the POCOs (Plain Old CLR Object) classes to represent our book store models. Address will be served as a Complex type. Category will be served as an Enum type. OData uses the Entity Data Model (EDM) to describe the structure of data. In ASP.NET Core OData, it’s easily to build the EDM Model based on the above CLR types. So, add the following private static method at the end of class “Startup”. Where, we define two entity set named “Books” and “Presses”. Now, it’s ready to add more real functionalities. First, let’s introduce the database context into the Web Application. The database context is the main class that maps Entity Framework Core database to a given data model (CLR classes). The code in “OnModelCreating” maps the “Address” as complex type. For simplicity, we build a class to contain the inline model data. In the following codes, I add two books in this container. In this class, we add a private instance of BookStoreContext to play the DB role and inherit it from “ODataController” class. Get(int key) returns a certain book by its key. You can try issue a request as “GET http://localhost:5000/odata/Books(2)” to get the book with Id equal to 2. Where, [FromBody] is necessary in ASP.NET Core. Adding the following line of code in Startup.cs enables all OData query options, for example $filter, $orderby, $expand, etc. Thanks to the OData Community for their feedbacks, questions, issues, and contributions on GitHub. Without their help, we can’t deliver this version. We encourage you to download the latest package from Nuget.org and start building amazing OData service running on ASP.NET Core. Enjoy it! Many code samples, which should have appeared inline with this article, are not visible here. You can find the code using the "This blog’s sample project" link.